"...more familiar appetizers would include the crispy pepper salt chicken wings and hand-made little pork steamed buns that "look like a bell on the bottom and a lantern on the top." in addition to appetizers, the taiwanese snack menu includes vegetables,soups, rice/noodle dishes, and entrees...our server also told us that the pepper salt chicken wings are among their most popular appetizers...(a little aside on the sweet potato angle i was interested to read that taiwanese people have historically called themselves "children of the sweet potato" based on the tuberous shape of their 14,000-square-mile island.) 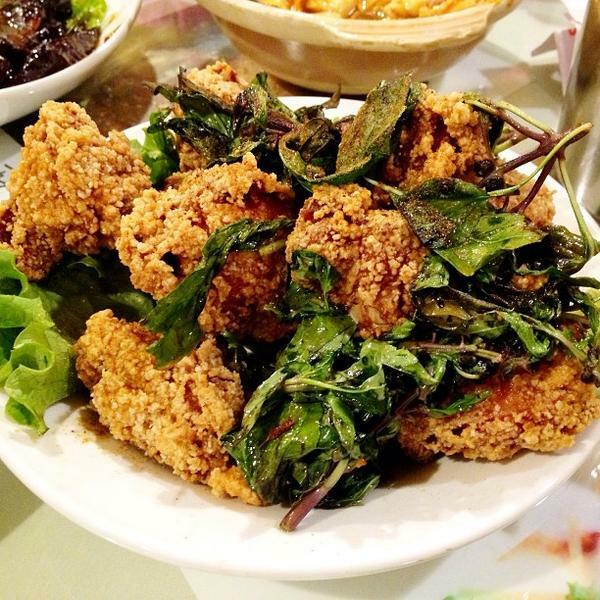 the bone-in pepper salt chicken wings have a hint of anise-scented 5-spice powder in the crumbly coating mix and came with a garnish of deep-fried basil..."